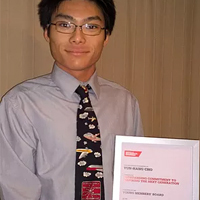 A member of the inaugural SELA cohort, Yun-Hang Cho, has been named the youngest ever IMechE young member of the year for his outstanding commitment to inspiring the next generation and his contribution to supporting the Institution’s key STEM engagement targets. As an individual STEM Ambassador he has worked with several of the Institution’s key partners to deliver a number of fun, informative events. Yun has volunteered with the IMechE in a number of roles on the South Yorkshire Young Members Panel and the Young Members Board. Yun is excellent at engaging young people as he uses his own experience of being a teenager to tailor his approach to towards them and has received consistently high levels of praise. As a STEM ambassador; Yun has partnered with the Engineering Development Trust (EDT) to deliver presentations on their Year in Industry scheme to secondary schools pupils. Demonstrating excellence in encouraging young people into engineering, he has been nominated by EDT for the Stephenson Award. As education officer, Yun works with various university societies such as Space Society to produce school outreach programmes, for example, to launch model rockets. He also manned the IMechE stand at “Get Up to Speed” Engineering festival as well as attending the Global Manufacturing Festival. On an institution level, Yun has strived to meet and work with other engineering institutions. He has recently become the RAeS Sheffield Branch Student Representative and is hoping to hold IMechE and RAeS events in the future.